Cattle Decapitation: pre-order “The Flesh Is Of No Use”! On October 6th 2017, Cattle Decapitation will release The Flesh Is Of No Use snuff-DVD, featuring three Mitch Massie music videos: Monolith of Inhumanity’s “Forced Gender Reassignment”, plus The Anthropocene Extinction’s “Clandestine Ways (Krokodil Rot) – Censored” and “Clandestine Ways (Krokodil Rot) – Uncensored”. 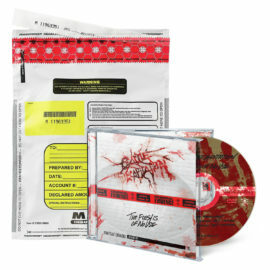 Included in a plastic evidence bag, this NSFW DVD is strictly limited to 1.000 copies…!!!! This October/November 2017, Cattle Decapitation will headline the Metalsucks & Exclaim! Aggressive Tendencies Presents “The North American Extinction Tour Part II: Inhuman Beings”. Featuring Revocation, Full Of Hell, and Artificial Brain as support (with Tijuana, Mexico’s mad doctors of gore Thanatology replacing Full of Hell on the first 3 dates), these upcoming shows are not to be missed!